The MGM-5 Corporal missile was the first guided weapon authorized by the United States to carry a nuclear warhead. 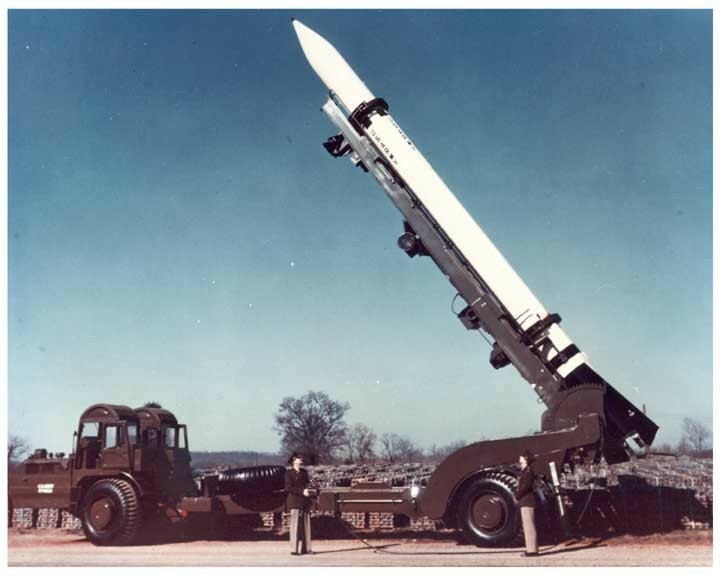 The Corporal was designed as a tactical nuclear missile for use in the event of Cold War hostilities in Eastern Europe. The first U.S. Army Corporal battalion was deployed in Europe in 1955. It was developed by the United States Army in partnership with Firestone Tire and Rubber Company, Gilfillan Brothers Inc., Douglas Aircraft Company and Caltech’s pioneering Jet Propulsion Laboratory. Added by Brian Burnell on 19 October 2014. Missile numbers are as yet unknown, but what is known is that 100 W-7 nuclear warheads were supplied for the British Army Corporals from US-stocks held in US-custody in Europe for use by NATO allies in time of war. That implies that to allow for training rounds fired there were in excess of 100 Corporals. Source is ISBN 0-8133-1611-1. Nuclear Weapons Databook Vol 5. British, French and Chinese Nuclear Weapons. Page 63. Authors: Norris, Burrows & Fieldhouse. Publisher: Natural Resources Defense Council & Westview Press, Boulder, CO. These 100 Corporal missiles with some Honest Johns, 8" nuclear artillery rounds, and nuclear landmines amounted to over 250 nuclear weapons in the hands of the British Army at peak levels. Whereas nuclear weapons held by the RAF and Royal Navy never reached those levels. Of the three Services, the Army had the bigger nuclear stockpile. Added by Brian Burnell on 21 October 2014.